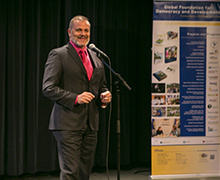 For its third Dominican Get-Together of the year, the Global Foundation for Democracy and Development (GFDD) hosted Carlos Alfredo Fatule, noted Dominican entertainer and actor for an evening of culture and discussion in Symphony Space’s Leonard Nimoy Thalia theater in Manhattan’s Upper West Side. During the event, Fatule staged a one-man show with a duration of approximately 40 minutes to a full house, discussing his beginnings and career path from day one to present through songs and monologues. Alongside the Dominican community who came out for the event, famed Dominican tenor and cousin of Fatule, Francisco Casanova, was in attendance. Carlos Alfredo Fatule is a professional singer, film and theatre actor with over 30 years of experience who has also produced, directed, and hosted numerous successful television and radio shows. He is also a musician, writer, lecturer, and entertainer. Among other current roles and activities, he offers training sessions for young and aspiring theatrical performers. As a part of its mission to promote the understanding and appreciation of Dominican culture, values, and heritage, and to create opportunities for discussions on contemporary issues relevant to Dominican society at home and abroad, GFDD reaches out to the Dominican community abroad and to all those interested in Dominican culture by organizing ongoing events: Dominican Get-Togethers. During these events, GFDD creates an opportunity for audiences to enjoy a Dominican movie, meet a prominent Dominican figure, or to participate in a discussion on topics of interest to the Dominican community in the US and in their homeland. At the same time, the events are a part of GFDD’s mission to facilitate and support collaboration and exchange between Dominicans at home and abroad as well as between the Dominican community and the greater NY Tri-State area.